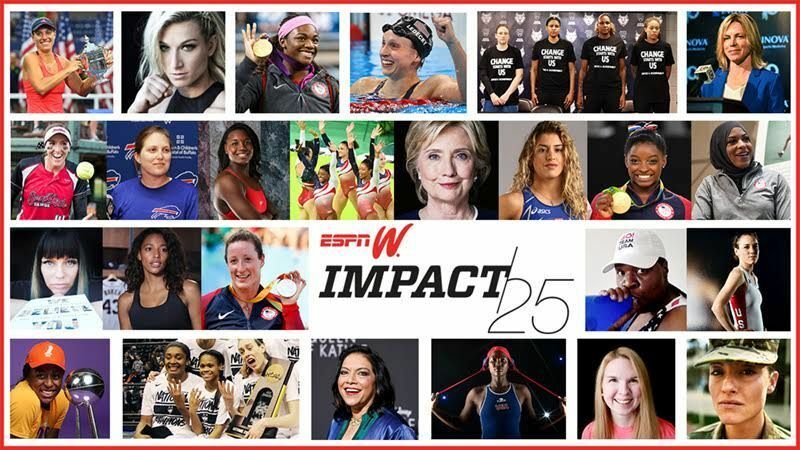 With every year that we select our IMPACT25 honorees, we're consistently wowed by the accomplishments of the people who make up our list. And 2015 was a hard act to follow. Serena, the U.S. women's national team, Ronda Rousey, Jen Welter -- so many highs, firsts and truly impactful moments. Then 2016 came along. 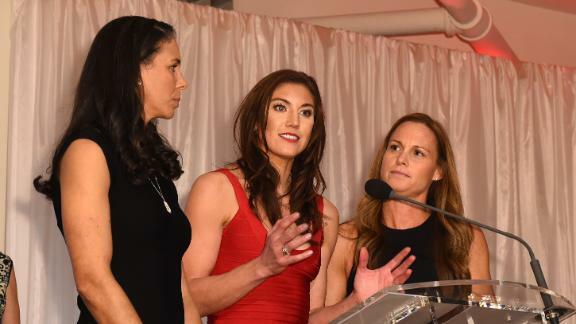 Rio, primetime TV, an election cycle to remember and activism center stage -- women in sports, and women in general, ruled this year. On Tuesday, Dec. 13, we'll announce the woman who captured our hearts (and votes) for IMPACT25 Woman of the Year, as well as roll out exclusive content and interviews around our entire list of honorees. Follow us on Twitter and Facebook for a sneak peek, and share who you would have picked for the top honor. The new WTA No. 1 player won the Aussie and US Open this year, unseating Serena Williams from the top spot. The first African-American member of the U.S. women's water polo team, Johnson helped win gold in Rio after taking Top Goalkeeper at the 2015 FINA World Championships. Shields won gold in women's middleweight boxing in Rio, becoming the first American boxer to win an Olympic title twice in a row. She is also an advocate for her hometown of Flint, Michigan. Led by Breanna Stewart, Geno Auriemma's squad dominated to win its fourth national title in four years. McFadden won her fifth NYC Marathon title in November, earning her a fourth straight sweep of all four major marathons (Boston, London, Chicago and New York). She also took home four golds and two silver medals in Rio, making her a 17-time Paralympic Games medalist. After winning her fourth swimming gold medal at this year's Invictus Games, U.S. Army Sgt. Marks poignantly returned it to Prince Harry, asking him to deliver it to England's Papworth Hospital as thanks for saving her life. The Olympic gymnasts dominated the field to win the team gold in Rio and became a cultural phenomenon afterward. They are the capper to Martha Karolyi's storied career. Maroulis won America's first-ever gold in women's wrestling at the Rio Olympics. As a professional stuntwoman, Graff became the first woman to complete Stage 1 of the "American Ninja Warrior" finals course, and has inspired thousands of little girls to chase their ninja dreams. The long-distance swimmer took home four golds and one silver in Rio, and broke two world records along the way. She also just smoked her own NCAA record. As WNBA MVP, WNBA champion and newly elected WNBA players' union president, Ogwumike had her best year ever. Biles won a record four gold medals at the Olympics in Rio, including all-around and team gold medals. In 2016, she also won her fourth-consecutive all-around national title -- a feat that hasn't been accomplished since 1974. The team took their 11th consecutive major title when they won in Rio -- the third Olympic gold medal in a row. In fact, the Americans have won every world championship and Olympic title since their last defeat in 2006. Tracy met with Baylor football players in July to discuss sexual assault prevention, bravely sharing her personal story. Tracy has been speaking publicly to college football teams across the country since she met with Nebraska coach Mike Riley and his team in June. The first female presidential nominee of a major party started the Global Sports Mentoring Program while she was Secretary of State. She also swam and played baseball as a young woman. The sabre fencer, who won a team bronze medal at the Rio Olympics, is the first American Olympian to compete in hijab. Luther has written extensively on the intersection of sports and violence off the field, especially college football and sexual assault. Her reporting helped expose the situation at Baylor, and she came out with a book on the topic in September 2016. Named the special teams quality-control coach for the Buffalo Bills, Smith became the first female full-time coach in the NFL. Bunbury is recognized for her groundbreaking portrayal of Ginny Baker, a rookie pitcher and the first female to play in Major League Baseball, on the new show "Pitch." By taking over the Olympics with her spot-on Twitter feed, the "SNL" comedian brought attention to women's sports. She's also been a strong voice against online bullying through sharing her personal experience. Aside from a stellar season and Maya Moore being one of the best basketball players alive, the team was a pioneer of athlete activism by showing up to a July game in warm-up shirts printed with "Black Lives Matter" -- the first of any pro sports team to do so. Director of "Queen of Katwe" and champion for female leadership in Hollywood, Nair also founded a film school in Uganda. The pro softball pitcher made history as the first female athlete to sign a million-dollar contract in an American women's professional league. The first head team doctor for both an NFL team and an MLB team, Dr. West leads the medical staffs for the Washington Redskins and Nationals. The Olympic and American record-holder tied Penny Oleksiak of Canada in the 100-meter freestyle, becoming the first African-American woman to win an individual Olympic gold in swimming.